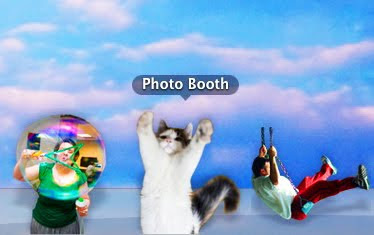 I thought I'd make my desktop a more fun place to be by changing all the icons in my dock to pictures! I can't help but smile every time I click on my friend Helen blowing bubbles, Matty on the swings, and Moo reaching out for a hug. 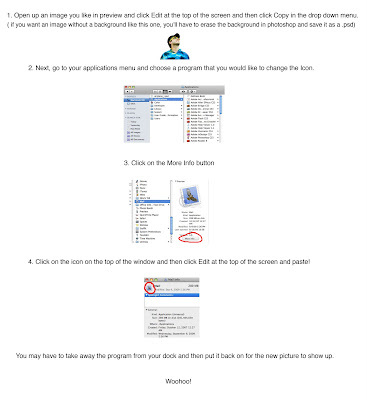 For all of you Mac lovers, I made a quick set of instructions on how to make your own fun icons. Click the image to see it larger. Those are the coolest dock icons I ever did see!!! I'd smile every time I opened an app too! Oh, that is so cute! I LOVE the kitty-cat. Aw, that's so cute! :) Way more personalized and fun. I think this is great. I have a question though, I erased the background and it still creates a white box. What am I doing wrong? I would like the background to be transparent like the other icons. If you could help that would be great! Ohhhh,that so cool and changing icons to pictures just make looking at your laptop much more fun and interesting !! Try double clicking on your locked background layer to turn it into a regular layer. Then erase, it should work now! I just love your idea. I wish I could do that with my PC at work. It would make working that much more fun. I have no clue what's been in the air but I've been all sorts of grumpy for a few days, and had to tell you your site made me feel SOMUCH lighter and better. How cool! Thanks for the instructions, I'm going to try it. That is very adorable! If I had a Mac, I would probably try this. so nice. one time i exchanged all my icons as well, but did not have the idea to do it with my own pictures! super excellent. makes me thinking about getting a dock. What a cool idea! I'll have to try it, too. this is so awesome!!! i didn't realize you could even do that! i'm so excited to try this when i get home :) thank you! Love how creative and colorful you are. This is an awesome idea! Thanks for sharing the how-to info. The Moo icon is so adorable! wow what fun! your the coolest! This is so brilliant! I'm doing it today! My desktop thanks you!!! This is fantastic! Thanks for making a tutorial...I'm definitely going to try this. do u know how to do it with windows vista? Thanks for this. This post fun and informative! I recently launched a new website and listed you on the resource page under "blogs to make you smile". Thanks for being so creative! Ooooh That's to cool Katie!! Love it :D Your so freakin' creative..... Someone taught me out to change my icons a while ago, but i forgot. So thanks for the refresh!! You are so creative! Thanks for sharing this! So cute! Thank you so much for showing how to do this! How adorable! And thanks for posting instructions... I know I would've tried to figure out how to do it anyways and wasted away my day on the computer. :P You rock! I love this idea. I'm with Jess though. 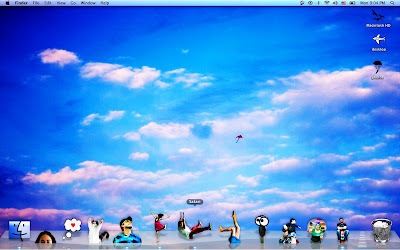 I got my background erased, but when I open it's still a white canvas with my floating people. I just want floating people no canvas. Can anyone help? Thanks for your sight and your wonderful creative soul. It's so uplifting and contagious. So very cool! Must try. I've posted a link to this from my site! Thanks so much! Hey Tallmisto! Before you erase the background , double click on the locked background layer in the layers palate and it'll turn it into a regular layer. That way, when you erase it'll take away the white background. then save it as a .psd and you'll have your floating people. I hope this makes sense! great idea :) thanks for including the instructions - now we can all have cute little personalised icons! im so glad you put up a how to! im changing the icons on my mac right now! And those icons look great fun! Love it, but u must be acostumed to tht no? all ur jobs are lovely (L) and Moo too,it reminds to the name of the pig in tht movie "uptown girls" hve u seen it?. What a great idea, I'm going to pimp my desktop with my illustrations! That is like the coolest idea ever! Don't have a MAC, so I don't think this is possible, but I love the idea. okay. I have a different problem :) did you know your awesome post would become a tutorial?? I did everything...and I have a transparent background....UNTIL I copy and paste into the icon, at which point it mysteriously turns to a black background. UGH! Help!? yay! this is so fun, ill be doing it for sure. thanks for adding instructions! I love this! The cat is great. Moo is a gorgeous kitty and you have a wonderful blog. I love watching clouds, as well. Next time, I walk, I shall look down for creative treasures. Just letting you know I LOVE your blog! I had to share it with others! Wow! Thats amazing! I will try it out asap! Thanks so much! oooh - love this!!! I have the same problem as peewee though.... if i copy from ps, i get a white background, from preview i get a black background :) maybe my software is too old? what a fun thing to know how to do! Thanks!! That's not true anonymous, you can change it as many times as you want! I'm not sure why your computer isn't allowing it.. I love Moo photo and Matty in the swings. Amazing idea. Katie, would you vivit my blog and watch my photoshoot if you have time? I'll really apreciate your opinion. is my first "professional" photoshoot, so I'm very excited. my favorite is Moo reaching out for a hug. hello do u mind sending me ur wallpaper ? is it just me or does this only work for some applications??? thanks. that was easy, who knew! now i really can go crazy with fun icons! ohhhhh man this really makes me wish I never spilled coffee on my mac. I just stumbled across your blog. You make me smile, and cry and laugh. You are an inspiration and bring joy to so many through your talents! Thank you!! Thank you SOOO MUCH for this post and the HOW TO instructions!! I spent yesterday afternoon changing all my icons and I am just soooooo happy with it all! It is like I have a new computer and I LOVE IT!! You're awesome! Thanks so much!! ure such a colourful girl, though ure just a year older than me. love this, love everything on ur blog! inspires my friends and i to bring smiles to pple in singapore! this was so much fun, thanks! So cool! 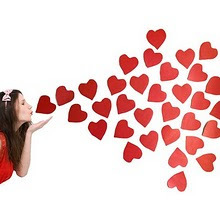 Thank you a lot for sharing! you are incredible! You bring colours and joy to my laptop haha! What's g o o d.
So cool, and I've started to do it... but some of the icons can't be changed? It's really strange, I can change things like iPhoto but not iTunes... Any idea what I can do to change them? Of course I had to try it out! MINE WON't let me do it? how did u do change into the birds/ plane ...? i tried double clicking on the layer and it erased everything i wanted it to, what do i do now? i saved it onto my desk top as a .psd, but it has that white background when it's saved. i'm very confused! so i did everything you said, i double clicked on the locked layer to make it a normal one, than i erased the background. i save it, and the white box shows up. i do save it as a .psd. though, i don't want the white background! helpp! perhaps you can make a tutorial video at your earliest convenience? cute idea but mine wont let me do it either. when i open my appilications menu..it's totally different looking than yours and when i find the application i want to change i can't figure out how to go from there. boo. I love this idea and wanted to try it myself on my Macbook, but it wouldn't work! I got up the step where I click the icon, but when I go up to Paste, the 'Paste' isn't clickable :( Does this only work on Mac desktops or am I doing something wrong?